As part of the preparation for the event, the artisans and tradesmen fabricated banners to be carried in the procession. This is not surprising as a significant number of tradespeople had participated in the Boston Tea Party, many of them as young apprentices or journeymen. The banners were all the same dimensions and represented the insignia or coat of arms of their trade. Two examples survive in the collection of The Bostonian Society (www.bostonhistory.org): the Mastmakers and the Cordwainers. The participation of the Cordwainers, one of the trades that proudly displayed its banner before the President, is particularly interesting. Modeled on its centuries old counterpart, the Worshipful Company of Cordwainers one of London’s esteemed livery companies. It was formed in 1272 and a Royal Charter was granted in 1439 during the reign of King Henry VI. The ancient guild system never took hold in the Colonies for a variety of political and economic reasons. The Cordwainers probably came closest as they were the only artisans to be granted a complete charter. Still, the ability to set prices and support those in need via traditional charities was denied them by local authority. The Cordwainers in the British Colonies were permitted to have some jurisdiction over quality control and craftsmanship, and the apprenticeship and indentures remained strong. The banner paraded by the city's proud shoe and bookmakers represented these ancient traditions. The background is silk with the ornament painted on freehand. While the figures are somewhat awkward, they nonetheless exude a certain charm. And one must remember that the banners were placed upon poles, above the throngs so would have been viewed at a distance. 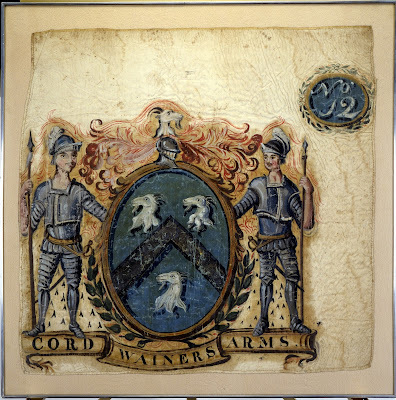 The primary attributes of the Cordwainers coats of arms are present, including the three goats heads (white goat leather from Spain) the blue and gold field and flanking knights in armour. Cordwainer and leather worker, Matthew Loring had the honor of carrying the banner. Born in 1751, he participated in the Boston Tea Party at age 21. He became a respected member of the leatherworker’s trade, conducting business on Devonshire and Brattle Street. He spent time in the lucrative role of leather sealer, a peer appointed position. By the time of the President’s visit, he was a family man in his late 30s, with a young daughter, Sarah. Loring married three times and had nine children, most of whom lived to adulthood. He had means enough to send his daughter Hannah (1800-1842) to Miss Perkin's Academy in Boston when she was 12 to learn silk embroidery. The survival of Hannah’s family genealogical register at the Metropolitan Museum of Art (www.metropolitanmuseum.org) adds another rich material culture artifact to what little we currently know of the family. Her register painstakingly records not only the names of Loring’s wives, but when they married, who they were married by and the children from each. As of this writing, there are no shoes identified as being made by his hands. Matthew Loring died November 7th, 1829 at the age of 70 and is buried in the Granary Burying Ground, Tomb 75. Although the cordwainer Loring did not leave a diary of the event as did his older colleague, George Robert Twleves Hewes (1724-1840), the banner and his daughter’s needlework, throw a sliver of light onto the place of shoemaking in early American society. Some historians have conventionally situated shoemaking at the bottom rungs of economic endeavor. Yet, the banner used in the October 25 procession and his daughter’s embroidery convey a different structure. Each banner had a small number in the corner, denoting the artisans place in the procession—cordwainers were 12th and the mastmakers, 24th. That these examples of what were most likely intended to be short-lived pieces of ephemera have been preserved is a credit to the families and to The Bostonian Society for maintaining them over the last century.